Bob Woodward, Brad Johnson, Gail Davis, Jimmy Hawkins; Directed by George Archainbaud, et. al. 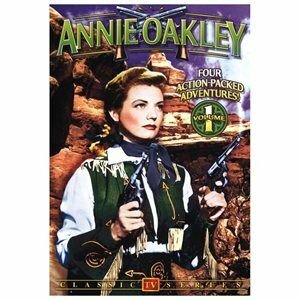 In four action-packed episodes of the popular wild-west adventure series, thrilling sagas of legendary sharpshooter Annie Oakley ( Gail Davis) unfold in the dusty town of Diablo. Chasing outlaws from the saddle of her trusty horse, Target, Annie keeps law and order with Deputy Sheriff Lofty Craig ( Brad Johnson) at her side. Helping them is Annie's younger brother Tagg, always eager to solve the town's exciting mysteries of suspense. A fictional account of the life of the famous star of Buffalo Bill Cody's Wild West Show, these episodes amazed audiences with Annie's fast and fancy shooting and breathtaking horse riding stunts. Mississippi Kid: After a robbery attempt, a young man staggers into town. Annie's high-riding saves him, but the brash lad thinks he knows everything and doesn't want Annie's help settling in. Danger lurks when the young man accidentally confronts the bandits at their hideout.End of a Gun: A former Rough Rider is framed for shooting an Indian. Annie, Lofty and Tagg must find the real killer before the slaying triggers an all out land war. Arrows and bullets fly as the peace keeping trio searches frantically for clues.Reckless Press: His best man shot dead by bank robbers during his wedding, a distraught groom unwittingly helps convict the wrong man for the crime. Annie and Lofty race against the hangman's clock to capture the brazen gang behind the killing.Valley of the Shadows: A store owner is robbed at gun point, then shot and left to die. His young daughter witnesses the bloodshed and the killers vow to silence her. Annie, Lofty and Tagg are determined to stop them. Directors: George Archainbaud, et. al.